Greenock has produced many fine athletes over the years and the area has been well served by some fine clubs – Glenpark Harriers and Wellpark Harriers are very well known and have served Scotland well. Among the clubs which are now defunct are Rankin Park, which was a ladies only club, and slightly less well known was Auchmountain Harriers . There are also several well known families in the sport in Scotland – the Hasketts and the Gunstones in Dundee and the Browns in Motherwell for example – but the five Spence brothers from Greenock (Gordon, George, Jim, Cameron and Lawrie) are probably unique. There has been a change in the nature of athletics in the area over the past 30 years or so with the newest club, Inverclyde AAC, serving the area and its population of all ages and abilities superbly well. Before the birth of Inverclyde there was Spango Valley AAC which appeared suddenly on the scene and, despite not recruiting big numbers of champion athletes from around the country but rather relying almost entirely on local talent, became one of the biggest players in the Scottish game. Cameron Spence wrote the following historical account of the club’s development. Spango Valley AAC was formed in September 1973 when a group of IBM employees decided they would like to form an athletics club. It was also at the time when there was a bit of unrest between the local clubs, Wellpark and Glenpark, and a certain local family. I will go no deeper. The club was originally called IBM A.C. But after a year or so the name had to be changed due to the rules and regulations then. It wasn’t a true Business House club because they allowed non-IBM’ers to compete for them. So the name was changed to Spango Valley A.C. This was where the IBM site was situated in Greenock. IBM was added in the late ’80’s when we were the first male club in Scotland to have our sponsors name added to our club title. From early local successes the club started to make its presence felt nationally from about 1978 winning many Local, County and District Championships at cross-country Relays and 6-man team contests. The results they achieved at the National Relay were outstanding for a provincial club. But the highlight for the club and myself was winning the National 4 man Relay at St. Andrews in 1985. The four man team was Peter Conaghan, Chris Robison (there’s is another great story on how he joined Spango), my brother Lawrie and myself. To win the National in the mid 80’s was something special. Scotland at that time had an abundance of athletic talent. What a day it was for the club. And the trip back to Greenock will go down in history. Over the years the club has had many international athletes running in the famous blue and yellow stripes. Here are some of the names: Graham Clark, Peter and Steven Conaghan, Lachie Stewart, Hammy Cox, Tommy Murray, Chris Robison, Mark Pollard (as a boy), my brother Lawrie and myself. Many of these athletes had won National and District titles. But we had a lot of very gifted and talented club runners who did a fantastic job for the club. Here are some of their names: Chris Leck, Terry Wilkie, Joe Gallagher, Charlie Doyle, Ray Hyett (the father of Graeme), Martin Coyle,Tom Dobbin and Stuart Hodge. These runners were just below International standard. In fact the times they were doing back in the 70 and 80’s would put them among the best runners around today. As the club came into the 90’s they realised that the top runners were not getting any younger. There weren’t many of the younger generation keen on the sport. Just like today. The Spango committee could see it would make sense if the three local clubs, Spango, Glenpark and Wellpark should get together and form one strong club in the district. Wellpark and ourselves agreed. Glenpark were initially keen on the idea but then turned it down at the last minute. The Inverclyde AC track club was formed 1996. 2 years later Inverclyde AC, with cross-country now added, started to make its presence felt on the roads and country in Scotland. They were the youngest ever club to win the National Relay Championship. The cross-country club was only 3 weeks old when they won the title at a windy day down in Irvine. The team that day was Tom Tipping, Steven Conaghan, Tommy Murray and Chris Robison. And that’s where Cameron’s Spango Valley AAC history ends. It is now appropriate to add some colour and detail to the account and we can look at their record in the various championships as they developed in the 25 year period. He was probably right that they performed better in relays than in championships and if we look at the National Championships, the club’s best performance was fifth in season 1984/85 when Cammie himself led the team home and they had four runners in the first 100 – he was 13th, Chris Leck was 22nd, brother Lawrie was 31st and Peter Connaghan was 61st. Although the club improved year on year from 1975, it was not until 1979/80 that they were in the first twelve teams in the race – but that in itself was a considerable achievement when you consider that it was right in the middle of the ‘running boom’ and they did not have a policy of going out to recruit stars. Their best performer in the National was Chris Robison with two second places (1987 and 1988), Hammy Cox and Graham Clark each had a fourth place. Reference has been made to how Chris Robison came to join the club. Chris was an extremely talented athlete from Derby who had come to Scotland while in the Royal Navy and married a Greenock girl. Her brother was a good runner and a member of Spango Valley called Terry Wilkie. That was the connection. It is maybe worth noting that the young club had two sub four minute milers at that time, Lawrie Spence being the other one. The major relay in the country was the eight stage Edinburgh to Glasgow. Their first run was in 1977 and they finished twentieth. To qualify for the prestigious relay four years after the club’s formation was real progress – many clubs tried for years without making selection for the event. Nevertheless a team containing such as Hammy Cox, Cameron Spence, Graham Clark and Chris Leck could maybe have expected better. But after finishing 10th, 10th and 21st the club was seventh in 1981 and picked up the medals for the most meritorious team performance of the race. They were helped by Lachie Stewart, now a veteran, in second place on the first stage and outstanding runs by Graham Clark (3rd quickest on the fourth stage) and Cammie Spence’s fifth quickest on the tough and competitive sixth leg. Now established in the top ten, the team was 9th and 8th before a third place position in 1984. The team was solid all the way through with several very good runs: Lachie Stewart 9th on the first stage, followed by Lawrie Spence who pulled the team up to fourth, J Gallagher who dropped places but not much distance to eighth, Chris Leck moved up to sixth with second fastest stage time, Cammie Spence up ro fifth with fifth fastest, Graham Clark came up another place to fourth on the sixth stage with fourth time of the day, young Peter Connaghan ran second fastest of the day in moving them up to third and Terry Wilkie ran the second fastest of the day on the last leg to keep them in the medal winning third slot. An excellent all round team performance. 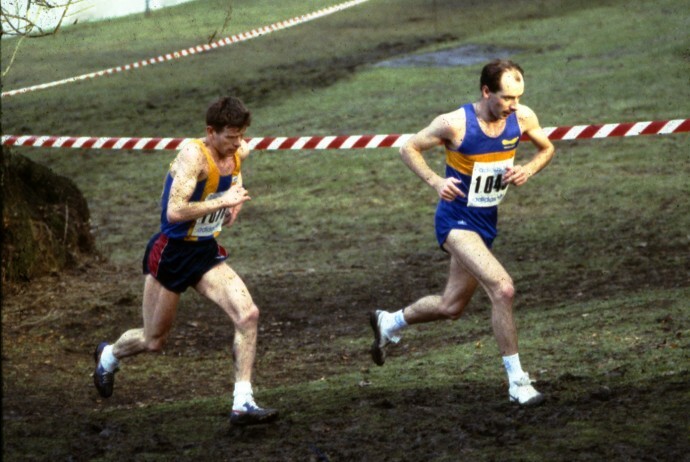 Chris Robison joined the club in 1985 and ran the second stage, turning in the day’s fastest time to hand over in the lead but, despite good performances all round, by the end of the race Edinburgh Southern, Shettleston and Cambuslang Harriers were too good for them so they were fourth team in the race. Between ’86 and ’88 they slipped to 22nd and did not appear in the line up again until 1991 when they were back up to 7th and again won the most meritorious performance medals. Founded in 1973, into the race in 1977 and then three sets of medals in 14 years. Not a bad performance by the club at all. 1979: 7th; 1980: 4th; 1981: 19th; 1982: 4th; 1983: 3rd; 1984: 4th; 1985: 3rd; 1986: 3rd; 1987: 2nd; 1988: 7th; 1989: 19th; 1990: DNR; 1991: 13th; 1992: 8th. Fourteen teams produced one second, three thirds, three fourth places and two more top ten placings. Many good performances but as with the national and Edinburgh to Glasgow teams Cammie Spence was the driving force, not only turning out but as often as not finishing among the top times for his stage of the race. As for the national four man cross country relays, the club peaked in the 1980’s with six sets of national championship medals including gold. It only took five years for their first set of medals when they were silver winners in November, 1978, with Hammy Cox, Graham Clark, Tom Dobbin and Cammie Spence in the team. They did not seem to travel well – no team at Inverness in 1980 and away down in 63rd at the same venue in 1989 – but their placings in the national four man relays between 1976 and 87 were 4th, 6th, 2nd, -, 4th, 3rd, 4th, 2nd, 1st, 3rd and 3rd. A fantastic record when the strength of teams such as Shettleston, Edinburgh Southern and, latterly, Racing Club are taken into account. The team which won in 1985 was made up of Peter Connaghan, Cammie Spence, Chris Robison and Lawrie Spence. The ‘peak period’ as a club was undoubtedly the 1980’s. The only other significant championships to be contested outwith the county were the West District Championships and Relays. 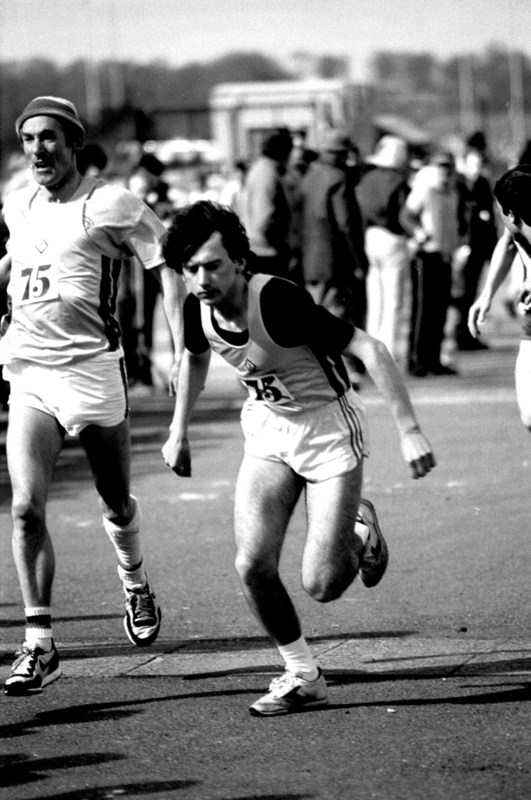 In the relays, the club had three first places, three seconds, two thirds and three other top 10 finishes between 1976 and 1987. Their first victory was in October 1979 with the runners being Hammy Cox, Gavin Clark, Tom Dobbin and Cammie Spence. The second win was in 1985 (P Connaghan, C Robison, C Spence and L Spence) and the third in 1986 (Osborne, P Connaghan, S Connaghan and L Spence.) In the championships, their first win was in 1985/86 with 93 points and the athletes responsible were Chris Robison 2nd, Lawrie Spence 3rd, Chris Leck 18th, Cammie Spence 29th, Lachie Stewart 32nd and E McKee 37th. Not content with that, they won it again the following year with four of the same team counting – Robison was first this time, Lawrie Spence seventh, Peter Connaghan ninth, Cammie Spence twenty first, John Brown twenty fourth and Chris Leck fifty fourth. These two wins followed a second (1983/4) and a third (1984/5). Not quite as good a record as in the relays but still pretty good after you count in another 6 top ten finishes. There was, however, as Cameron says, a falling away in the very late 80’s and early 90’s. Reasons would include his own of aging runners, lack of younger ones coming through but there were some very good athletes available – the two Connaghan brothers could have had a long career as international athletes ahead of them, and there is a report by Cammie of a positive recruitment policy among the local schools, youth organisations, etc. That might have made a difference in the medium term but from outside the district and at a distance of 25 years we cannot even attempt to judge the situation. What we do know for certain is that the efforts put in by Cammie and his committee did bear fruit – success at national and district level in the 1980’s was clear to see, and that is without examining the club record in such classic races as the Nigel Barge race and the McAndrew Relays. If we look at some of the runners who represented the club, in alphabetical order, it is an impressive list. Graham Clark was a very good runner, a pupil of Donald Macgregor when at school, who had personal bests of 8:13.5 (3000m), 14:38.22 (5000m), 30:38.4 (10000m) and who ran in the IAAF World Cross-Country championships twice. Graham died in 2003. 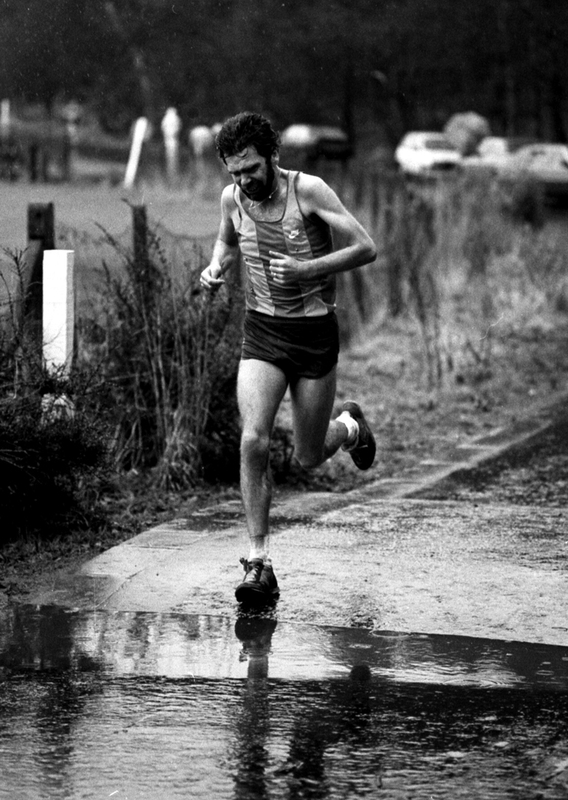 Peter Connaghan had a best of 14:28.0 (5000) and ran in the IAAF World Junior Cross-Country Championship in 1983 and was not ranked after 1984. 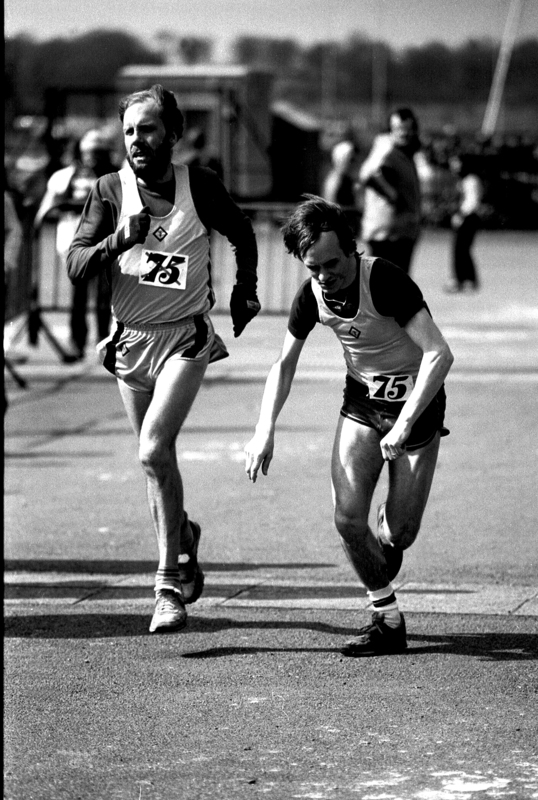 Steven Connaghan was Peter’s brother and had bests of 14:37.0 (5000m), and 31:28.66 (10000m). Tom Dobbin is a very interesting chaaracter. Initially a highly ranked half miler as an Under 17 with Glenpark Harriers in the mid 60’s when he had pb’s of 1:56.5 in both 1965 and 1966, Tom reappeared with Spango Valley in the 1980’s. Chris Leck was a very good runner who was highly rated by everyone on the scene. Principally a classy cross-country and road runner who never showed the same form on the track, he had some outstanding runs in the Edinburgh to Glasgow. Tommy Murray was a man of many clubs – Greenock Glenpark, Cambuslang, Spango Valley and Inverclyde – and an excellent athlete to boot. A Scottish internationalist on the country, the road, the hills and the track Best times of 8:11.46 (3000i), 14:02.5 (5000m), 29:12.32 and 4 national 10000m titles to his name as well as a Scottish cross-country title. 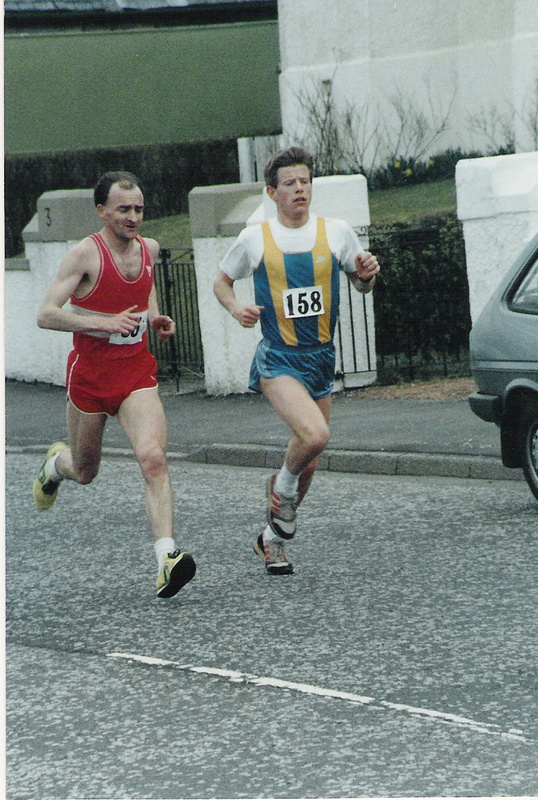 Chris Robison has had a lot said already – a four minute miler who married a Greenock girl and joined Spango Valley in 1985, leading them to team success at national, district and county level on the road and over the country. Hugely talented, his pb’s include 3:50.69 (1500m), 8:05.94 (3000mi), 13:55.7 (5000m) and 28:47.26 (10000) as well as having a 2:22 marathon to his credit. Represented Scotland on the track, the road, over the country and on the hills. Cammie Spence was a driving force behind Spango Valley AAC. A good committee man he almost certainly ran in more races for the club than any other. Over the country or on the road, championship races or relays, it was all the same. A very good athlete he had personal bests of 8:22.0 (3000), 14:20.0 (5000m), 30:00.84 (10000m) as well as representing Northern Ireland over the country..
Lawrie Spence was another man of many clubs representing Glenpark, Strathclyde University, Shettleston and Spango Valley. A sub-four miler and a 2:16 marathon man with outstanding times at every distance in between. 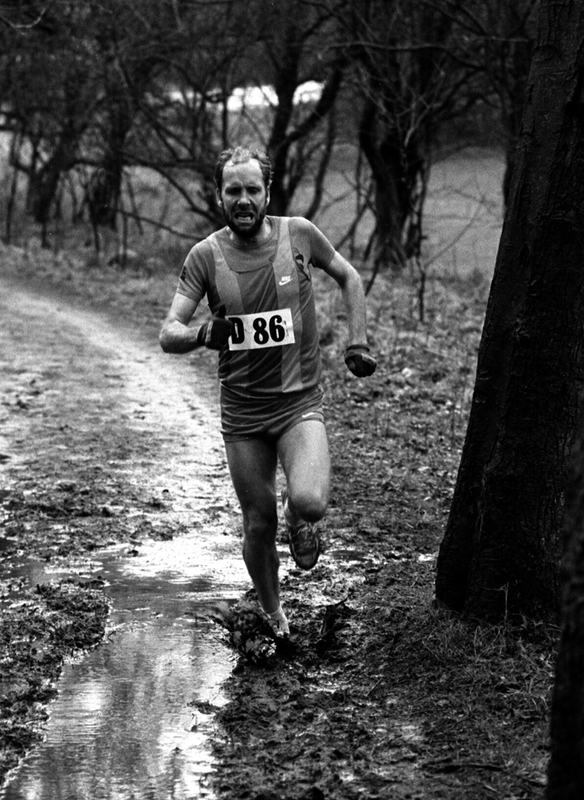 Captain of the Scottish cross-country team in the world championships and with victories in the SAAA championships at 1500m (twice), 5000m (twice) and 10000m (three times) he was a superb addition to any team. Lachie Stewart – who needs to say anything about Lachie? 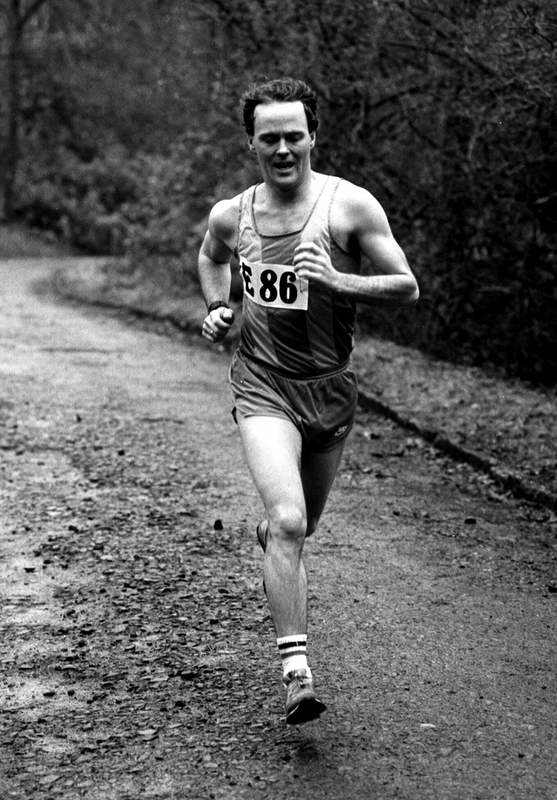 Terry Wilkie was a good standard team runner – never ranked nationally as an individual, he was a member of many a medal winning team for Spango Valley from the 70’s through to the amalgamation with Inverclyde AAC.